Internet entrepreneurs have a lot on their plate when searching for the right SEO research tools. The right tool matters because SEO is an important part of realizing the entrepreneurial dream. You’ve got the next big idea, and you need to maximize its reach. SEO is one way to reach your local market. Alas, the research must go on. So, with all the tools available at your fingertips, how do you choose? The differences between Ahrefs vs SEMrush vs Moz can seem small, but the advantages you gain from one over the other may be significant. This guide will take the work out of making your choice. As mentioned, there are many tools available for people who need to do some major SEO research. This is everything from Neil Patel’s Ubersuggest to Spyfu, but there are three that are likely to be recommended by a professional SEO Consultant Chicago. Ahrefs is a widely used suite of SEO research tools. The blue-chip client list for Ahrefs includes Uber, Facebook, and other recognizable names in digital media. The over-arching goal of Ahrefs is to provide users with an easy way to see what their competitors are doing in terms of content and SEO so that they can do it even better. 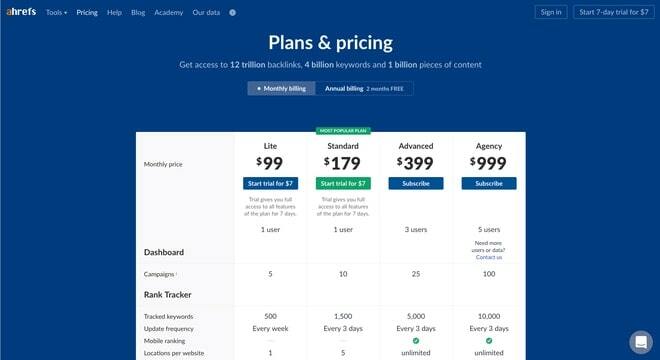 Ahrefs offers a 7-day trial that costs only $7. But after that the price ranges based on use-case, starting at $99 / month. Or get two (2) months free by signing up for their annual plan. These features and tools offer a number of benefits for any and all SEO Expert, as described below. That’s Ahrefs, in a nutshell. SEMrush touts it’s status as an all-in-one digital marketing toolkit. But does it live up to the hype? Clients like eBay, Quora and Booking.com would agree that it does. Or get two (2) months free by signing up for their annual plan. This is highly recommended if you select SEMRush as your primary SEO research tool as it is normally used on a daily basis. Each of these tool-sets results in a number of benefits for the SEMrush client. SEMrush gives clients access to incredible insights, innovative strategies, attractive keywords, and more bonuses for SEO consultants. Moz claims to have more than 37,000 customers, tracking over 141,000 links. So what’s their story? Keep reading. Save 20% when paying yearly with Moz Pro. These tools come with a number of benefits that mirror the competitors described above. These products, while similar, all have pros, cons and unique things to offer. Here’s the full scoop on using Ahrefs, SEMrush, and Moz. With a Pro suite, Local suite and free tools, Moz services have the most options for affordability. The Pro version comes with a 30-day free trial that is considered a pretty lengthy test period compared to other services of the same vein. But using Moz has both its pros and cons. Moz is an awesome tool for bloggers, SEO consultants and knowledgeable business owners who want to jump-start link building and keyword research processes. Ahrefs is a powerful tool for the savvy Chicago SEO Expert to keep in their back pocket. It’s extremely versatile and offers impressive tools for creating an endless supply of relevant keywords while determining both search volume and difficulty. While we don’t have anything negative to say about Ahrefs — it’s accurate, robust and a head above the rest when it comes to backlinks — the company doesn’t offer much in the way of inexpensive tools for clients to get their feet wet. And maybe they don’t have to. But instead, they ask clients to trust them by diving right in with a 7-day trial and then a billing cycle. For some, there may not be enough that stands out about Ahrefs to inspire the trust to make such a pricey commitment. SEMrush is hailed as a go-to tool for organic research on the health of a website. This is great for marketers who want to get a good feel for where their clients rank, organically, at the start of a new project. It has a full suite of features that offer unlimited SEO potential to businesses from small to large. In the end, SEMrush is widely heralded as the most robust tool for content marketers, SEO consultants and savvy business owners to take control of their site’s SEO. That’s because it comes to SEMrush vs Moz, the former has all the free offerings of a tool like Moz, and more. But it’s toolkit is even more robust than Ahrefs, offering the best of both worlds. Where Ahrefs offers one up on SEMrush is in accuracy and backlinks. No other tool offers the link building index of Ahrefs. But you can’t beat variable cost flexibility available from SEMrush when comparing SEMrush vs Ahrefs. When considering your options, there are a few other things to think about beyond features, benefits and pros and cons. One such consideration is to think about what tools you are already using and whether they complement or integrate with your chosen SEO research provider. Each of the above-mentioned tools has a number of integrations. But even if applications don’t integrate, per se, it’s also smart to think about which tools complement one another. For instance, some marketers suggest using both Moz and SEMrush as complementary tools with different use-cases. Another tool might be BuzzSumo for content research. There are a number of tools like this that make things easier for an SEO Consultant Chicago or beyond. For most business owners, using these tools is about saving time and receiving the most accurate information. From an accuracy standpoint, the clear champion is Ahrefs. Ahrefs saves you time as well, with easy to read dashboards. It is probably the most intuitive tool of all the ones we discussed. But SEMrush also has time-saving features because it includes PPC and social features. Unlike other tools we discussed, you can save time with SEMrush by getting all of your digital marketing research done in one place. When it comes down to the cons of these three tools, we are mincing hairs. All of these tools are good. That makes finding the best one for your business even tougher. Consider which tools allow you to try before you buy via free or cheap trials and limited versions readily-available for general use. The ones that stick out as being the best for trial and error are Moz and SEMrush due to their free tool suites and trial periods. So, when it comes down to Ahrefs vs SEMrush vs Moz, which one takes the gold medal? It’s not an exact science, but SEMrush and Ahrefs usually come out on top because they offer more features. For those looking for free options that they can use without diving head first into something new, SEMrush is the clear champion. Analyzing SEMrush vs Ahrefs, SEMrush also gets points for being more robust and crossing over into other areas of marketing research like PPC and social media. But if you’re looking for a good SEO research tool, only. And what’s more important to you is saving the time of struggling with a learning curve, Ahrefs might be a superior choice. While Moz is our runner-up tool, you could make a case for using Moz in conjunction with a tool like Ahrefs or SEMrush to have the most transparency and access to SEO tools. At Marketing By Kevin, we encourage entrepreneurs to use this guide in conjunction with considering what’s unique about their business to decide which tool (or tools) is the best fit. For our latest marketing post like this one, please be sure to follow our blog. I have been a digital marketing consultant for over 5 years. This list really good but I think it misses some latest softwares.One source I trust is https://www.cuspera.com/app/acquire-customers-by-social-media-marketing/G1-A1003–/context?industry=computer-software. which has all the latest softwares and all the latest reviews and blogs.